Do not get confused with wasps and bees. Although they look identical, their behaviour slightly differs from one another. Wasps can be of various sizes. Do not be shocked if you see wasps of a very small and large size. The color of wasps can be of blue, black, or metallic green. The waist of a wasp is generally pinched. If you have flowers bloomed in your garden, then wasps are bound to fly and make nests in your nest. Wasps Not all wasp species are aggressive in nature. Most of the wasp species have the nature of leaving stings on human beings when the insects turn out to be aggressive. When wasps feel threatened by humans, they attack on human beings by stinging them several times. The stings of wasps are indeed very perilous. The best way to prevent wasps from stinging you is to get wasp control services from one of the best pest control operators of Perth. The wasp services of our pest agency will never allow wasps build nests in your nest. There are many wasp species which are flying around your property. 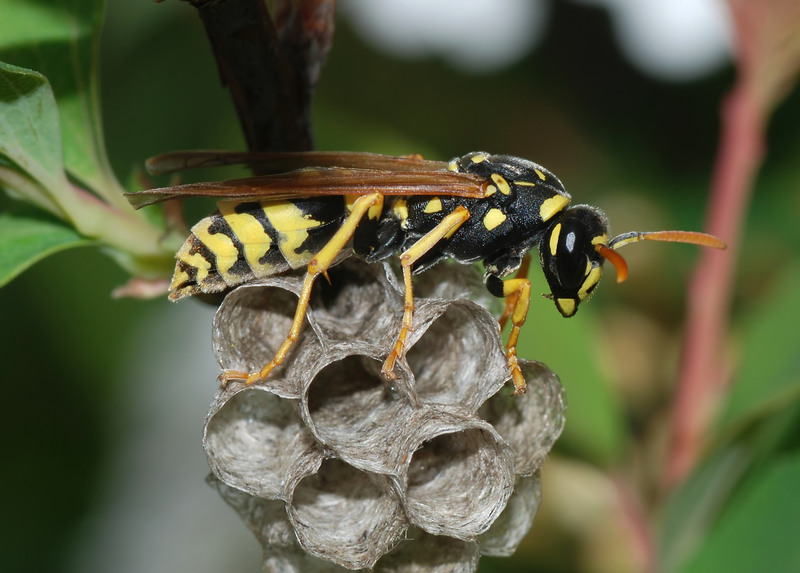 The most common wasp species which are often spotted in the area of Perth are spider wasps, paper wasps, wood wasps, red wasps, great black wasps, yellow jackets, mud daubers and bald faced hornets. The nest of each wasp specie is different from the other wasp specie. Get to know about different nests of wasp species from our wasp professionals who are well aware of every habit and behavior of wasp. You will happen to spot wasp nests in almost all places. Check out the nests in garden fixtures, car engines, grasses, bushes, in mailboxes, on the outer surface of structures, voids, bushes and in all untouched and hard-to-locate places. Keep yourself off from the surroundings where wasps’ nests are built. Wasps may sting you if the insects find you near their nests. The stings may result in toxic reactions. Disturbances in circulatory system, trouble in breathing, low blood pressure, red bumps on swollen portions of the skin, headache, nausea, fever and fainting crop up due to the toxic venom of stings of wasps. You will have to implement integrated solutions to keep wasp colonies at bay. At our wasp pest control Perth company, we carry out the program by way of executing inspection which is done in every suspicious spot, going through the survey report several times to understand the underlying issues of wasps breeding, discussing the nesting habits and behavior of wasps with house owners and business owners and choosing the wasp controls, repellents and treatments to keep wasps out of your zone for a long time.